Eating Paleo doesn’t mean you have to pull the plug on hanging out and having fun. Enjoy yourself! Dine out with friends and family! Toast the good times! Throw a bash of your own! 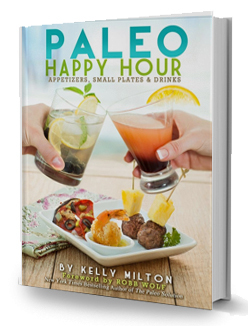 Paleo Happy Hour will teach you how to embrace the social life without fear of falling off the Paleo wagon. Dough Truffles, Pecan Pie Bars, and lots more! Social occasions may test your Paleo resolve, but with Paleo Happy Hour, you don’t have to chuck all your hard work or be a party pooper. More than 100 recipes for appetizers, small plates, and pub grub that will excite and please the taste buds of Paleo and non-Paleo guests alike! More than 20 alcoholic and nonalcoholic drink recipes that are as Paleo as they get! Tips and tricks for drinking and entertaining with weight loss and health in mind! Party menus pairing appetizers, entrées, drinks, and desserts, plus tips to pull off a flawless event! Howdy! Somebody in my MySpace amass imparted this site to us so I came to look at it. I always enjoy Paleo foods and drinks. In the weekend, I always try to make new recipes and foods. nice article keep it up,and i am wait for your new article. nice article keep it up,and i am wait for your new article.